These professional display systems are designed to set up and take down quickly and travel lightly. They're ideal for trade shows and fairs, recruiting programs, and sales presentations, as well as for art exhibits. Display elements attach with Velcro® to the foam-backed cloth surfaces. Also included are two 50W halogen lights, which may clamp on at the top. A reusable, corrugated shipping case with a strap and handle is included. Palladian 3-Panel Display — For a 6' table. Stands 44" high, each panel is 22" wide. Comes with clear acrylic header, ready to letter. 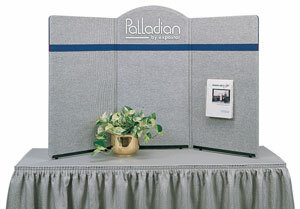 Palladian 4-Panel Display — Stands 44" high, comes with acrylic 10" × 42" header, ready to letter. Fits on a 6' table. ™ Expogo is a trademark.